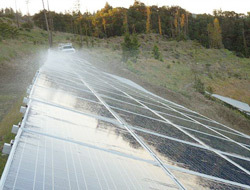 What are the advantages of a solar panel washing system? 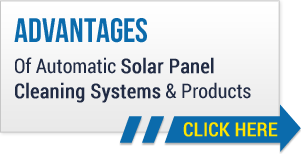 Our solar panel washing systems offer a number of wonderful benefits. There are other solar panel cleaning systems on the market, but none are as effective or easy to use as the ones you will find at Heliotex. Our home residential and commercial systems allow you to clean easier, more often, and to increase output from your panels. Whether you own or are leasing panels, the use of one of our systems will allow you to eliminate manual cleaning altogether. Heliotex also offers Unirac security fasteners and Prosolar security fasteners, which are the finest anti-theft devices on the market. You’ve invested a great deal in your solar panels, and what a wonderful decision that was. Get the most out of that decision by making certain your panels are as clean and efficient as they can be. We’d love to show you how! Heliotex solar panel cleaning systems will keep your panels looking and working their best at all times. It doesn’t matter if you own or lease your solar panels, or if you are in the business of leasing panels yourself. Our products represent the finest on the market and are among the most affordable, making them a valued resource that you’ll be glad you came to know more about. Caring for your panels regularly with our solar panel washing systems will keep them working at maximum output. Furthermore, when you use solar panel cleaning systems the rigors of manual cleaning are eliminated. Increased efficiency and less work on your end is a win/win for you, so what are you waiting for? Keep your home panels working at 5 to 30% more output with the help of the professionals at Heliotex.